Paintings and images of St. Jude include a number of defining characteristics, but many might not know what those symbols represent. Below are answers to some common questions about the symbols attributed to St. Jude. 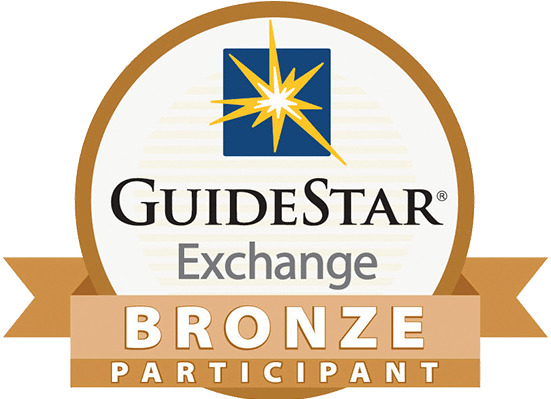 Why is St. Jude holding a medallion? The medallion is an impression of Jesus, known as “The Image of Edessa.” King Abgar of Edessa (now part of Turkey) was suffering from a serious illness. He had heard of Jesus healing others and called for Jesus to heal him. Jesus pressed His face onto a piece of cloth and gave it to St. Jude to present to King Abgar. Upon receiving the cloth King Abgar was healed. This scene is depicted in one of the stained glass windows at Our Lady of Guadalupe Church, where the National Shrine of St. Jude is located. Why is there a flame above St. Jude's head? Known as “The Tongue of Flame,” this represents the Holy Spirit descending upon St. Jude and the other Apostles at Pentecost. “They saw what seemed to be tongues of fire that separated and came to rest on each of them. All of them were filled with the Holy Spirit and began to speak in other tongues as the Spirit enabled them” (Acts 2:3-4). Why does St. Jude wear green? 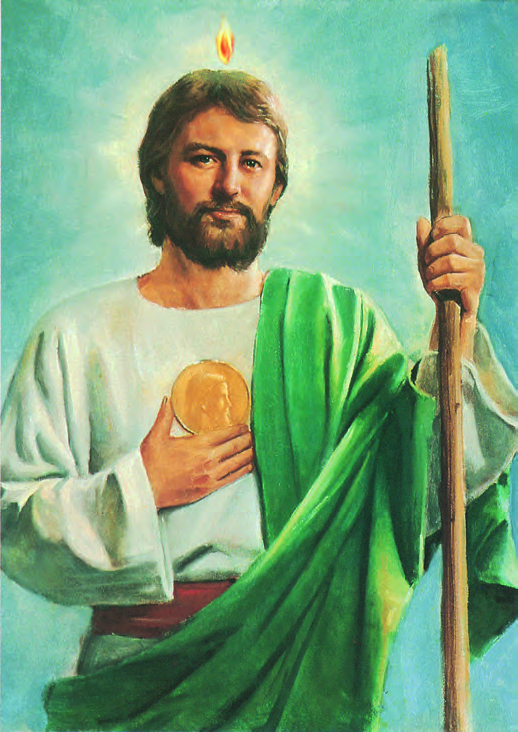 St. Jude is depicted wearing green because green symbolizes hope and renewal. Just as in spring when foliage and flowers spring up with renewed life, we turn to St. Jude, our Patron of Hope, in difficult or seemingly hopeless times. What is St. Jude's relationship with Jesus? There are differing views on exactly how St. Jude is related to Jesus. Some writings identify St. Jude as “Judas the brother of James,” while others refer to him as “Judas the son of James.” Galatians 1:19 tells us that James is a brother of Jesus. However, in the Gospel of Matthew 13:55, St. Jude is said to be a brother of Jesus. “Isn’t this the carpenter’s son? Isn’t His mother’s name Mary, and aren’t His brothers James, Joseph, Simon, and Judas?” Regardless, we know that St. Jude was one of Jesus’ Apostles and that they shared a close relationship. 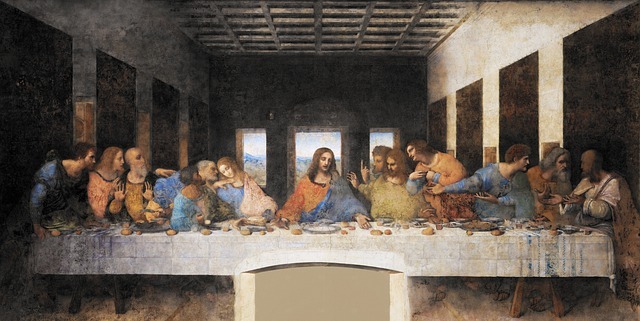 Where is St. Jude located in da Vinci's Last Supper? Located second from the right, St. Jude Thaddeus is shown with a beard and long, light colored hair. He is sitting between St. Simon (far right) and St. Matthew (third from the right). How did St. Jude die? St. Jude was martyred in 65 with St. Simon in Persia on October 28 (their feast days). There are differing accounts regarding how St. Jude died. Some say he was beaten to death and beheaded, or hacked to death, which is why he is often depicted with a club or axe. St. Jude’s remains are located in St. Peter’s Basilica in Rome. Is St. Jude Thaddeus the same person as Judas Iscariot? No! The names “Jude” and “Judas” are Greek translations of Judah, which was a common name in Biblical times. Though similar in name, St. Jude is not the one who betrayed Jesus. 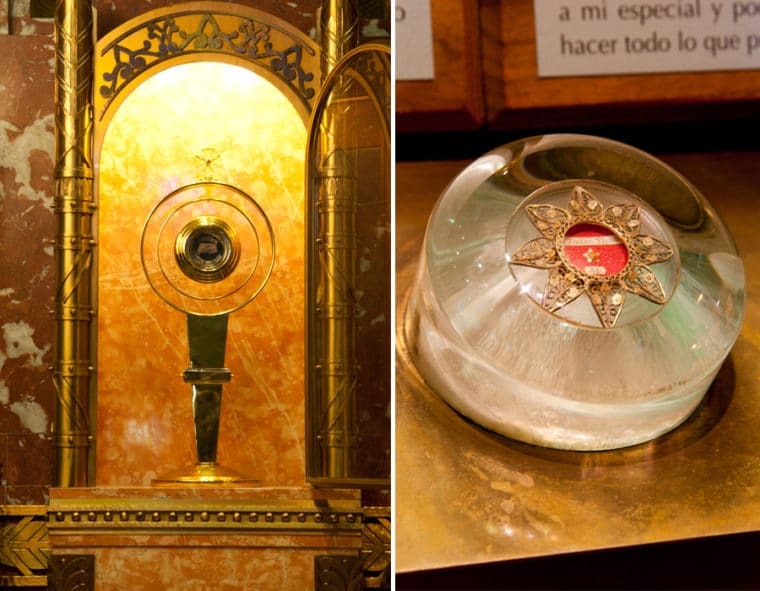 Does the National Shrine have any St. Jude relics? The Vatican was especially generous in giving the National Shrine of St. Jude two first-class relics of bone in the 1920s. The large relic at the altar represents the complete reverence St. Jude gave Jesus as one of His twelve Apostles. The small relic at the kneeler is heavily protected in special glass and anchored in brass; this allows us to make it accessible to touch for all who visit the Shrine. How did devotion to St. Jude begin? After his death, many turned to St. Jude for his intercession in prayer. Jesus inspired the devotion to St. Jude for St. Bridget of Sweden when He directed her in a vision to turn to St. Jude with great faith and confidence. In a vision, Christ told St. Bridget, “In accordance with his surname, Thaddeus, the amiable or loving, he will show himself most willing to give help.” During the Middle Ages, St. Jude was widely venerated, but perhaps because of the confusion between his name and that of Judas Iscariot, he slipped into temporary obscurity. In the early 20th century, St. Jude Thaddeus was relatively unknown to the general Catholic population in the United States. In 1929, the first devotional services to St. Jude were held by Claretian Fr. James Tort at Our Lady of Guadalupe Church in southeast Chicago; before the year ended, the country’s only National Shrine of St. Jude would be firmly established. Word of the devotions to St. Jude gradually spread from that tiny corner of Chicago to other parts of the country. During the Great Depression and World War II, thousands of men, women, and children attended novenas at the Shrine; devotion to the “patron saint of hopeless causes” spread throughout the country.